There’s no shortage of portable rechargeable batteries The Best Pokemon Go Power Banks The Best Pokemon Go Power Banks Pokemon Go beats the heck out of a phone's battery. Squeezing a bit more Pokemon-catching juice out of your phone requires a power bank. But what's the best battery out there? Read More on the market. Manufacturers have started adding new features in a bid to make their lumps of lithium stand out from the rest. One such manufacturer is OUTXE, who have produced a rugged dust and water resistant battery with dual inputs and outputs. In addition to offering quick charging, it’s got a flashlight and a solar panel to help you out in emergencies 7 DIY Solar Projects for Off-Grid Survival 7 DIY Solar Projects for Off-Grid Survival Solar panels and batteries are an effective way to power your home in a survival situation, but they aren't the whole story. Let's explore some other ways to harness the sun's energy! Read More . At just over $50, is this the high capacity rugged battery you’ve been looking for? Read on to find out. Output 1: USB Type-A delivering 5V/3A, 9V/2A, and 12V/1.5A. Input 1: Micro USB accepting 5V/2A. Input 2: USB-C accepting 5V/3A. Depending on how you charge the device, your charge time varies. The fastest charging method, using both inputs, takes around seven hours. If you go the USB-C route you can expect a full charge to take around 11 hours. The weaker micro USB port brings a full charge up to 13 hours. Note that you can’t use the 5V/3A input to charge from older computer USB ports. I experienced this on my mid-2012 MacBook Pro, and macOS gave me an error explaining that a device was using too much power. The other input worked fine, though charging via a low powered USB ports takes forever. There’s a solar panel on top of the device, offering a 2W converter with a full charge quoted at around 75 hours. Of course, you’re not meant to rely on the solar charger and manufacturers recommend topping up from mains power before you head outside. It’s a nice feature to have in a pinch, and passively charging all day 10 Smarter Ways to Charge Your Smartphone 10 Smarter Ways to Charge Your Smartphone How do you recharge your phone? At a guess, I'd say you plug it into a standard charger, or even the USB port on your computer. The dull way. Read More will help keep the battery topped up. The solar panel is always active, whenever enough light is detected. There’s a red LED that lights up to let you know you’re topping up. In the box you’ll also get a USB-A to USB-C cable, and a micro USB to USB Type-A cable. These are likely limited to 5V/3A maximum, as per the specified power draw. That means these cables won’t double up as fast chargers. OUTXE stress that their batteries include protection agains over charging, over discharging, overheating, and short circuiting. There’s also a built in “self protection mode” which causes all indicators to flash, letting you know you need to charge the battery as soon as possible to avoid damage. OUTXE stands for Outdoor Extreme. The company’s strapline is “Outdoor Extreme Energy” and the box describes the power bank as a “Savage” 20,000mAh rugged power bank. It seems they’re keen to prove a point. The battery ships with an IP66 water and dust resistant rating What Makes a Device Waterproof or Water-Resistant? What Makes a Device Waterproof or Water-Resistant? A lot of devices are marketed as waterproof, but that can be severely misleading. Most are actually water-resistant. What's the difference? Here's everything you need to know about it. Read More . As a result, the device is dust tight, and protected against heavy seas or powerful jets of water. It falls short of the IP67 rating, which allows devices to be submerged entirely. I tested this by covering the battery with a strong hose, and the water protection seems to have held up just fine. One thing I noticed is that water tends to get stuck in the screw holes, so it’s best to give the battery a good bash against something to get it all out. While the outer chassis is rubber and plastic, the ports are covered by tough rubber flaps that sit nicely within the battery’s four power ports. They’re quite tight to close, at least on new models, and they need some serious force in order to close and open them. Only time will tell how long they’ll remain this way, and it’s probably the weakest part of the whole “rugged” construction. As you’d expect, these covers flap around a bit while charging. I’m not sure the rubber holding these flaps to the battery is going to last long, since it’s so thin. The battery is housed within a 2.5mm thick black plastic outer shell. On the corners are rubber impact protectors. These protectors are plasticky, non-grippy rubber which offers moderate protection for common impact zones. Inside, OUTXE put EVA shock-absorbant pads on the battery. Despite the tough talk, OUTXE recommend that you “do not knock, drop or puncture the product.” This is par for the course in terms of sensible recommendations from manufacturers, but it seems slightly odd given the language they’ve used to describe the product and its unique selling point. A surprisingly useful feature is the flashlight, which offers up to 35 hours of light on a full battery. There are three modes: bright, weak, and an SOS function. It’s a handy feature that will appeal to outdoor enthusiasts, with a bright LED. It could even double as a tent light when hung from the included karabiners. The Only USB Charging Bank You Need? At 20,000mAh, OUTXE have produced a high capacity cell that pushes the limits of what you’d want to carry around all day. While the battery might fit in your largest pockets, at 1.16lbs (530g) you won’t want it there for long. That said, the design is a pleasing one. The battery is narrow enough to comfortably grip in one hand, and that makes the difference when using the flashlight function. It’s not awkward to hold or pick up, and the ridges etched into the front and sides of the outer shell provide a decent amount of grip. There’s enough juice to charge your smartphone and other devices multiple times. A full charge is enough to refill the iPhone X’s 2,716mAh battery over seven times. For the Pixel 2 XL (3,250mAh) that’s at least five full charges. While the battery will charge the Nintendo Switch in standby mode, you can’t play games and charge at the same time. This is a serious battery, not designed to top up your smartphone at the end of the day. Rather, it can provide multiple refills from empty. You won’t be carrying it in your pocket. It’ll live in your bag, or strapped to the outside of it. This is made possible by two fabric loops on the battery chassis, and two karabiners included in the box. You can use these to strap it to a bag, stop it moving around, and make sure the solar panel is properly exposed at all times. It’s all backed up with an 18-month manufacturer’s warranty, which is a good sign that OUTXE have faith in their own product. OUTXE have come up with a thoughtful design that’s ideal for longer trips, camping expeditions, and outdoor adventures. It’s ideal for charging your smartphones and tablets, certain cameras and consoles, headphones, bike lights, and other USB-powered gadgets. Despite being tough, you should probably opt for an IP68 rated power bank if you’re buying purely for rugged use (OUTXE make those too). If the weight and size of this battery doesn’t bother you, you can do much worse at this price point. The Savage is designed for small devices, rather than large ones. You’ll need to pick a different power bank if you want to charge your USB-C laptop The 6 Best Laptop Power Banks to Recharge Your Computer Anywhere The 6 Best Laptop Power Banks to Recharge Your Computer Anywhere Need more charge for your laptop or MacBook? These awesome battery packs can charge your laptop and more wherever you go. Read More . Want to win one for yourself? Enter our competition below! Explore more about: Battery Life, MakeUseOf Giveaway, Rugged. 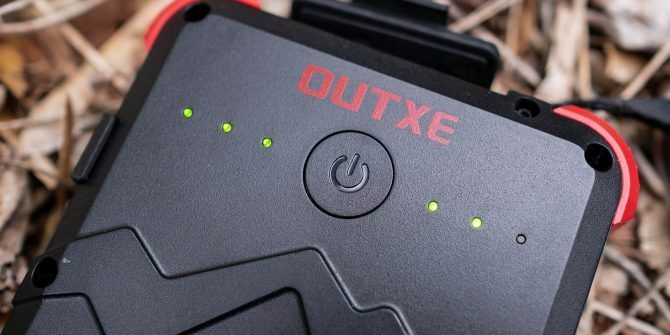 Who is the winner of OUTXE Savage 20,000mAh Rugged Battery ? nice thing but, how can i win this thing if there's no entry bonus code there ? Nice product indeed. Great pricing too. Is the title correct because you reviewed the 20,000 mAh not the 2,000 mAh right?